Are Pinterest crafts even for real? It just seems like so much time and effort and materials and money go toward making a DIY project worthy of Pinterest. Here's the inspiration for my DIY menu board. It's so pretty and has planned out dinner items and a grocery list Post-It. I don't think I'm that creative with decorations and I really don't want to have to type and print menu items out into little strips, and I am probably too lazy to put in the effort. But I recognize the value of having tried and true recipes ready to go. 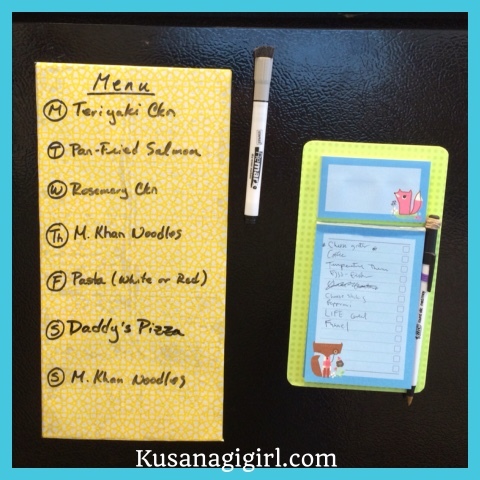 It is a DIY dry erase menu board magnetized to the fridge. I was telling the hubs the other day that eventually the entire kitchen will be my command center. So why not put the food related stuff on the fridge? The dry erase needs some elbow grease when erasing and having recipes on cards could help with head scratching moments when I'm trying to build the menu for the week. But this is better than what I had before (paper and pen) and looks cuter too. Based on the size and shape of the cardboard, cut everything to fit the cardboard with the magnet sheet on one side and the contact paper as the final layer on the other side. Our grocery list is from the $1 section at Target and works just fine. It would probably make my life easier if I did have some dinner items on a card or something so I don't have to think so much about what's for dinner. But we'll see. For now I'm pretty happy with this little board. 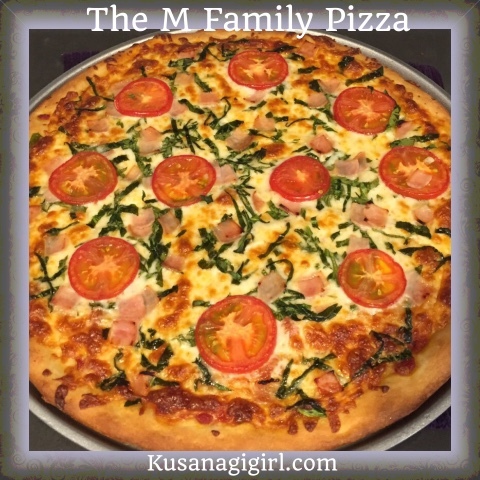 Do you want to see what a Daddy's Pizza looks like? Yummy!!! Ok, that's it for now. Have a great dinner!